If you are asking yourself what to buy in Poland on your next trip to this Central European country, you should know that there are many souvenirs that you can bring home in your suitcase. This Central European country which borders the Baltic Sea has traditional products that will delight you. The Polish Republic attracts an increasing number of visitors to its beautiful landscapes, its rich history, and cultural attractions. When you visit the country, don’t forget to take one of the following Polish souvenirs back home with you. As in many other countries, Polish handicrafts are generally the most valued souvenirs. In the case of Poland, their gold and silver metalwork is outstanding, so don’t miss out on the opportunity to buy a traditional Polish artisan item. In this case, the colored glass vessels with silver lids are the perfect gift as a souvenir of the journey. The designs and colors of Polish ceramics are very reminiscent of the Russian patterns used to decorate tableware and items for the home. If you are a fan of this type of product, you will love the coffee sets, the vases and urns, and all the popular ceramics from this country. A place that is recommended for buying good items is the city of Boleslawiec, which is a production center of distinction. 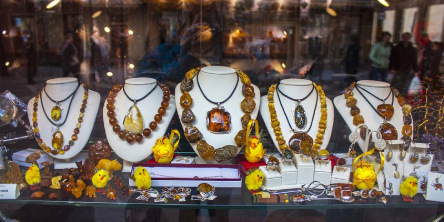 Baltic amber is one of the most traditional items to buy in Poland. This type of amber is known throughout the world because of its quality and, for this reason, it is much used in jewelry and different artisan crafts. The cities of Gdansk and Warsaw are the two places recommended for you to buy it. Perhaps you already know about the salt lamps and their countless benefits in the home. These attractive lamps are made of salt from the mines at Wieliczka and are therefore guaranteed to be authentic. Without a doubt, this is one of the souvenirs to buy in Poland that will hit the mark. If you visit Krakow during your journey, don’t forget to take a figurine of Wawel Castle and its dragon back with you as a souvenir. It is the perfect gift for the children, as well as for more grown-up dreamers. Of all the things to buy in Poland, slippers to wear in the house are really warm. They have wool interiors and are finished with leather on the outside, so they are both attractive and practical. You will certainly want to take pair back as a souvenir. For antique lovers, and particularly for those who collect objects from the Second World War, Poland is the perfect place to find unique treasures. In many markets and antique shops, you can find helmets, medals, decorations and much more. One of the most exclusive Polish souvenirs is the chess board, particularly those manufactured in Krakow. So if you like this game, or you want to surprise someone with a great present, this is a perfect choice. At the market in Sukiennice, there is an endless variety of chess pieces and chess boards of all shapes, sizes, and colors. But handicrafts are not the only traditional Polish products you buy. We should also include food and drink. Krupnikas is the best-known Polish liquor at an international level. Honey, aromatic herbs and various spices are used to prepare this drink. But apart from this well-known drink, Poland has a great variety of honey-based drinks of different types. Vodka is so ingrained in the Polish culture that it competes with Russian vodka in quality and consumption. There are many varieties of vodka, each with a different flavor, and you can find honey, fruits, flowers, and spices. If you want to take the most famous traditional Polish vodka home, choose Zubrowka. And for lovers of beer, Okocim and Zywiec are the stars of the country, although there are many other brands throughout the length and breadth of the country. In the south of the country, they make an artisan ewes cheese which is hard and smoked. This product will delight cheese lovers. The Oscypek is popular throughout the whole of Poland, so much so, that there is a tasting route for the cheese consisting of 19 Polish cities. If there is something to buy in Poland which will be a sure-fire success, it is the ginger biscuits. Not only are they delicious, but they are created with designs inspired by fairy tales. Each biscuit is a little work of art in itself, and they are also packed in little boxes which are perfect as gifts. This and much more, including the famous Russian dolls, are the best things to buy in Poland during your trip. A journey that you will surely want to repeat. If Poland has caught your attention, leave us your number so we can call you to discuss the voyage that awaits you.